For the most part, comics are a visual medium. Except when they are presented through audio. We saw Marvel last year debuting its Wolverine: The Long Night 10 episode podcast, which launched on Stitcher Pro’s paid for service. 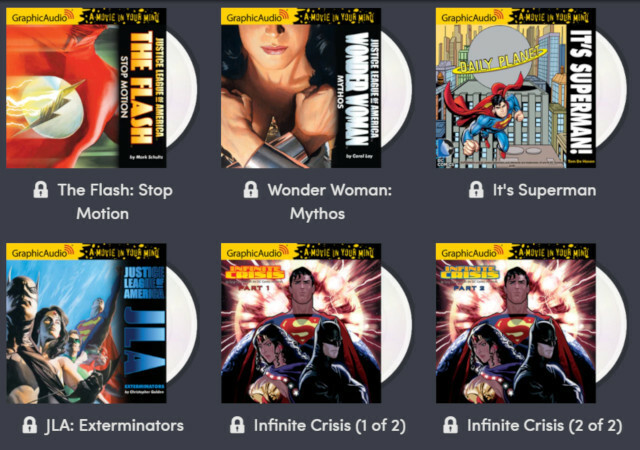 DC fans can now head over to Humble Bundle for the DC Comics in GraphicAudio bundle. What’s this you might ask? Audiobooks of DC stories on the cheap, with $440 worth of titles going for a low $15 on the top end. You don’t have to pay that, since for only $1 you can get five titles, including Batman in The Stone King and Wayne of Gotham, plus Green Lantern in Hero’s Quest and Sleepers (Book One). Wonder Woman makes her debut in the second tier, so for $8 you have her in Mythos, JLA: Exterminators, and Infinite Crisis. Her team member, Superman appears in It’s Superman and DC Universe: Lost Sons ,which also features the "one who devours your entrails and thoroughly enjoys it,” better known as Lobo. Do you have some cash to drop? $15 gets you everything, including two more stand-alone Batman titles, Final Crises and the two part series of 52. These are fully dramatized audiobooks, and not simply a reading of the books. If you’ve been disappointed with recent DC movies, hopefully these audiobooks will provide some aural pleasure.